This is the second part of a longer blog post: part 1 is here. People who sign up to your email list need nurturing, and at the same time you need to work at signing up new readers. 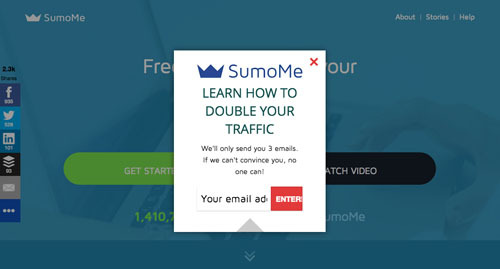 You’ll always be losing subscribers through unsubs, changed email addresses, spam filters and just being invisible – whether it’s because you don’t send often enough to the list, or your emails are disappearing into spam or ‘promotions’ folders. Then again, those subscribers who are still opening and responding to your emails after many months or years are your most loyal and valuable. It’s important to create valuable content for your newsletters so that people look forward to your email updates. But as well as this, what else can you do to help keep your list growing? 1) Encourage shares & forwards whenever you send an email – top and tail with ‘forward to a friend’ messages and include social sharing buttons. 2) Capture visitors by making your sign up box stand out. For example – with the SumoMe WordPress plugin you can set a floating sign up message & box to appear, and customise it to first visits only if you don’t want it to be too annoying. 3) Offer an incentive to join your list – for example a sample chapter, a free tip sheet or entry into a giveaway. There is a caveat here: some people will join a list just to get the freebie, then unsubscribe. Just saying! 4) Offer a short course or series by email – delivered by timed autoresponders. You can do this if you use a service such as Aweber, or the paid version of Mailchimp. The thinking behind this is that repeated exposure in the few days after signing up not only reminds readers of who you are and what you offer, but takes advantage of the ‘honeymoon’ period when people can still remember why they signed up for your emails and how great you are. For example, you could offer a short story, delivered by seven installments by email. 5) Turn your email list into a community in itself – perhaps give email subscribers access to a private group on Facebook, or let them have exclusives on cover reveals, earlybird invitations to your book-related events or readings and other ‘thankyous’ to let them know you appreciate them. Loyal email subscribers are likely to be your best advocates, talking up your work on social media and face to face with others, so they are worth looking after. 6) When you send out a newsletter or email exclusive, let it slip on your blog and in your social updates. It doesn’t have to be as direct as ‘My newsletter is going out today, sign up now or miss out’ – which can come across as hectoring – but mention the actual content – if it sounds intriguing, if there’s something ‘in it for them’ and if you make it easy to sign up, you should see some takeup. 8) Promote a book giveaway, and have entrants submit with their email address. You can create a simple giveaway for free at Rafflecopter, for example. 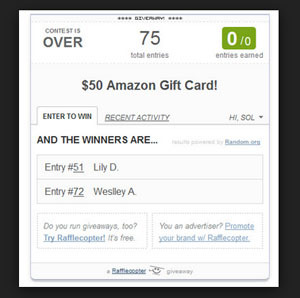 Rafflecopter allows you to create and administer giveaways, even randomly selecting the winner(s) for you. There are no doubt many other ways of growing your list. Best results come from a multi-pronged approach! When you’re browsing other people’s blogs and websites, notice how they do it. Let me know in the comments if you’ve tried these or other methods and how they work for you.